Explore Ellsworth Maine during your visit at the Castine Inn, a Maine Inn offering quality lodging in historic Castine Maine on the Maine Coast near Acadia National Park and Mount Desert Island. At first glance Ellsworth appears to be just a crossroads town full of fast food, used cars and shopping malls. Take a closer look though and you'll find Main Street in the older part of town is lined with handsome old brick buildings which house some interesting shops worthy of browsing. Among them are Rooster Brother 800-866-0054; kitchen wares, gourmet food and wine; open Mon. - Sat. 9:30 A.M.-5:30 P.M., The Grasshopper Shop 207-667-5816, Beal's Gifts 207-667-2161, J.B. Atlantic Antiques 888-667-2062 and the John Edwards Market 207-667-9377. Also located on Main Street is the Grand Auditorium 207-667-9500, a restored art deco theater, staging film, live theater and musical events year round. The Colonel Black Mansion and Woodlawn Museum 207-667-8671, on Route 172 on the south edge of Ellsworth, is a good example of 19th century Georgian architecture. Its furniture, pottery, paintings, and even the original family linens, give a glimpse of life in the 1800s. Don't miss the carriages and sleighs in the carriage house, and a walk through the grounds with its elms, evergreens and formal gardens is reason enough to visit. You will also find Maine's only tournament sized croquet court. Regular play on the court is available on a pay-per-game basis. Free introductory lessons are also offered. On the opposite side of town you'll find the Birdsacre Wildlife Sanctuary and Stanwood Homestead 207-667-8460. The 1850 home of Cordelia Stanwood, a noted ornithologist, is filled with period furniture and photographs. The grounds of more than 200 peaceful acres of woods and ponds offer well-marked trails and picnic areas. Many non-releasable native birds inhabit various shelters. The Nature Center has a fine selection of books, unique gifts and art, as well as displays of mounted birds and a sizable egg collection. As you leave Ellsworth on Route 1, you will soon notice that Maine license plates outnumber those from out of state; there are fewer cars but more pickups, many loaded with lobster pots and other fishing gear; and, on the water, work boats are more prevalent than pleasure boats. You are entering a part of Maine that most summer visitors don't discover and one that we enjoy so much for its rugged authenticity, spectacular scenery and less hectic pace. Leave Route 1 at West Gouldsboro and take the loop around the Schoodic Peninsula. This drive, which has been designated a National Scenic Byway, will take you to the unprotected rocky promontory of Schoodic Point where surf and spray from the Atlantic Ocean are impressive, particularly following a storm at sea. Along the way enjoy the picturesque villages of Winter Harbor, Corea and Prospect Harbor. Back at the top of the peninsula at Gouldsboro, watch for signs for the Bartlett Winery 207-546-2408. There are guided tours and tasting rooms where you can sample the award-winning table wines made from local blueberries, apples, and pears, or the raspberry and strawberry dessert wines. To venture further Downeast really makes more than just a day trip but we encourage you to do it if time allows. Here you will find some of coastal Maine's most spectacular scenery and working fishing villages largely unchanged by time. Enjoy the architecture in towns like Steuben and Cherryfield where Victorian mansions, with their ornate trim and slate roofs harken back to prosperous days in lumber and shipbuilding. 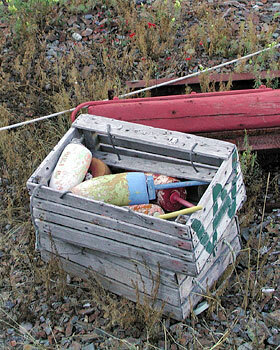 Stray off of Route 1 whenever the opportunity presents itself, and explore the fishing villages of Jonesport and Beals Island. Continue on to Great Wass Island, a Nature Conservancy holding with fantastic views and hiking trails for the hardy. At Roque Bluffs there is a long sand and pebble beach that we have found deserted even in the middle of August! 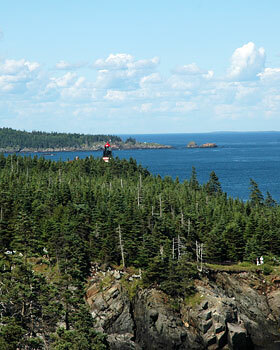 At West Quoddy Head you reach the easternmost point in the U.S. marked with a candy-striped lighthouse. Views from the grounds are far-reaching, and there is a hiking trail along the cliffs overlooking the Bay of Fundy. That's just a brief overview of what treasures await those who venture beyond the usual tourist limits. If you're intrigued, check out your travel literature or ask at our front desk and we'll help you map out a plan.